The title Our Lady of Loreto refers to the Holy House of Loreto, the house in which Mary was born, and where the Annunciation occurred, and to a statue of Our Lady which is found there. It is the first shrine of international renown dedicated to the Blessed Virgin and has been a true Marian centre of Christianity for several centuries. Flown By AngelsTradition has it that a band of angels scooped up the house from Nazareth in the Holy Land to save it. From pillaging and destruction and transported it first to Tersatto, Dalmatia in 1291. It is said investigations at the time found the house was built of limestone, mortar and cedar wood. These materials were commonplace In Nazareth, but almost unobtainable in Dalmatia (Yugoslavia). 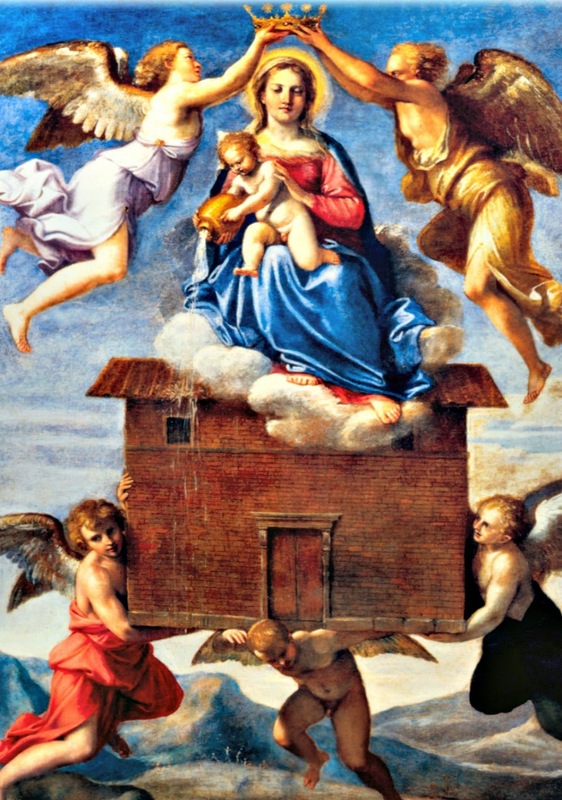 Then three years later, the little house was said to have been once more flown by angels this time to Recanati, where he did not stay long, and finally on to Loreto in Italy. Loreto in special esteem, taking it directly under the authority because of the "divine mysteries which took place there". Written at the door of the Basilica are the words: "The whole word has no place more sacred....for here was the word made flesh, and here was born the Virgin Mother..."
On entering the Basilica, one finds beneath the central dome, and just behind the high altar, a rectangular edifice of white marble, richly adorned with statues. However the white marble forms only a protective coat. The contrast between the exterior richness and the poverty of the interior is stark. Inside are the plain, rough walls of a cottage of great antiquity, ten metres by five metres and about five metres high. In its original form the Holy House had only three walls because the eastern side, where the altar now stands, opened onto a Grotto. with the house, but has since been destroyed. The dark colour of the image represents the original image of Our Lady of Loreto, which was carved from wood and subsequently darkened over the centuries of being exposed to the soot from the oil lamps which burn in the Chapel. The original statue was destroyed by fire, and the friars determined that it would be most proper that the replacement statue reflect the darkened condition of the original prior to the destruction by fire. who come in their thousands. Prior to filling the lamps each day, what oil remains in the lamps is poured into small bottles. For centuries this oil, blessed by both a priest with a sacred blessing, and by Our Lady as it burns in the Shrine, has long been valued by pilgrims to the Shrine as an oil of blessing and healing. The Pope's believe divine mysteries have taken place at the Shrine. Papal MessagesOn 4 October, 1962, Pope John XX111 announced: "This is the lesson that comes from Nazareth: holy families blessed love and homely virtue, blossom with the warmth of ardent hearts that are full of generosity and good will." The same theme was also taken up by Pope John Paul 11 when he went on a pilgrimage to Loreto on 8 September, 1979. He said:" The House of the Holy Family! comes from the great mystery of the Incarnation; from the mystery of her Son." Pope John Paul 11 also expressed the hope that all the children belonging to the human family may have a roof over their heads and be given a home. The Holy Family of Nazareth is a model and the guardian of all Christian families. This is why the faithful invoke the Virgin of Loreto, Patroness of the family and of the home.